Degreed helps you quickly and easily discover, share, and track ALL kinds of learning resources — from courses to videos to articles and more. Content: Degreed connects you to the world’s largest collection of professional learning content both from inside and outside your organization — over 250,000 courses and more than 3 million articles and videos from 1,300 sources. All in one place. Tools: Degreed empowers you to learn every day with powerful tools including a daily learning playlist, learning pathways, unified search and sharing. You can also follow people to see what they’re learning and join groups to learn with and from colleagues around the world. Insights: Degreed tracks ALL the learning you do — the courses you take, the books and articles you read, even the videos you watch. Then you can view, share and get recognized for your progress with your own personalized profile and dashboard. All yours: Best of all, the record of everything you’ve done to skill up is yours. You own it. You control who sees what. And, the record can go with you, for life. Find what you need to learn and build your career. Fast. Get access to premium courses, TED Talks, articles, videos, MOOCs, and more. All in one place. Learn what you need to do your job. When, where and how you want. Learn anywhere, anytime from any device. Get recognized for ALL the learning you do. Rate, recommend and share learning with others. You can log in from work or from home. From any device. The first thing you’ll want to do is to select the topics you want to learn about. Then the system will start suggesting learning content tailored to your needs. 2. Check Out the Learning Feed. The first thing you see when you login is your learning feed, suggestions based on your learning interests. You can customize the suggestions you receive by adding categories to your profile, enrolling in pathways, following others, and joining groups. 3. Want to learn more? Search the library. Simply use the search field at the top of every page. Select “External Resources” to see the world of resources from across the web. Degreed has cataloged over 250,000 online learning courses and 3 million informal learning activities from more than 1300 sources. 4. Mark an item complete. Get credit for the learning you do by marking an item complete once you’ve finished it. 5. Share great stuff. Find something great and want to share? It’s easy to recommend content to others on your team or across your company. Simply click the recommend icon, search for the people or groups with whom you want to share, add a comment and send. 6. Get credit for everything you learn. Use the browser extensions to build your profile. 7. Leverage the mobile app. 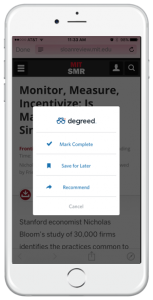 Degreed is mobile enabled for any device. You can also download the mobile app. 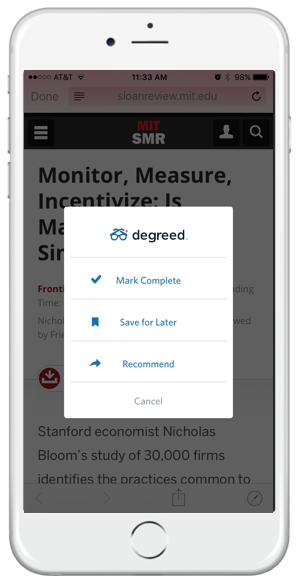 When you read an article or listen to a podcast from your phone, select to “share” the item with Degreed then you can mark the item complete, save it for later, or recommend it to others. 8. Update your email settings.